For the modern federation of Protestant churches, see Evangelical Church in Germany. Stormtroopers holding German Christian propaganda during the Church Council elections on July 23, 1933 at St. Mary's Church, Berlin. The German Evangelical Church (German: Deutsche Evangelische Kirche), colloquially Reichskirche, was a unified state church that espoused a single doctrine compatible with National Socialism. 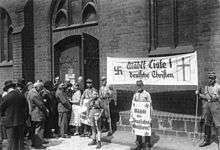 The Protestant opposition to Nazism established a rival German Evangelical Church, called the Confessing Church, an umbrella of independent regional churches. After World War II, both of these bodies were replaced by the new umbrella called Evangelical Church in Germany. In the reorganization of the German states during German mediatisation and the Napoleonic era, in many of the new or territorially extended states, churches previously under other meanwhile dethroned rulers came under the jurisdiction and control of new governments. Many rather monodenominational German states had turned into multidenominational between 1803 and 1815 due to the widespread annexations of smaller states whose people clung to other creeds. At that time in no German state were government and religion separated. State governments abolished older local or regional statutes prohibiting the settlement of adherents of certain creeds in municipalities, towns or even regions whose populations had consisted so far only of adherents of another creed. For example, the formerly Catholic free imperial cities of Überlingen and Ravensburg had to accept Protestant citizens, and provide a place for Protestant worship; similarly, formerly Protestant cities as Schwäbisch Hall had to offer Catholics a place of religious worship. In the 1820s almost all Roman Catholic diocesan boundaries in Germany were redrawn according to the new state borders (see Roman Catholic dioceses in Germany after 1821). As to Protestantism in Germany, then almost exclusively consisting of either Lutheran or Reformed Christians (Calvinists), with very few Mennonites only in Northern Germany, state governments sought to reorganize — modernize — the cumbersome system of Protestant congregational fragmentation into statewide streamlined, economical ecclesiastical structures, often crossing borders of Protestant denominational or regional traditions. In the 19th century, states such as the Grand Duchy of Baden, and the kingdoms of Prussia, Württemberg, and Saxony sought to reduce religious conflict among their subjects by legitimising a range of Protestant practices that required individual Protestant congregations to accept individuals of other Protestant creeds. In Prussia, for example, with distinctly Catholic, Reformed or Lutheran areas, but also Reformed faithful living as diaspora in many urban centres, like the then king and his children in then prevailingly Lutheran Berlin, the King Frederick William III — married to a Lutheran — established this with the Prussian Union of the Lutheran and Reformed Churches, or sometimes, simply, the Union, originally aiming at a unified Protestant confession, but after strong resistance materialising as an only administrative union of congregations of different Protestant confessions within one umbrella church body. In Baden Lutherans and Calvinists (Reformed Christians) merged in a church of united confession in 1821 (today's United Evangelical Protestant Church in Baden) and in Württemberg, the unified Evangelical State Church in Württemberg of Lutheran tradition but Upper German Reformed liturgy, were established via organization edicts issued following mediatisation. In Saxony and the then Thuringian states, like in most of Bavaria (except of the then Bavarian Rhenish Palatinate) and all of Northwestern Germany Lutherans and Calvinists never merged. The practice of merging Lutherans and Calvinists (Reformed Christians) was not universally accepted; dissenting mostly Lutheran groups frequently sought permission to migrate to other German states, Australia, the United States, Canada and Brazil so that they could practice their own particular "brand" of Lutheran or other Protestant worship. In particular, the Old Lutheran communities in Germany, Missouri, South Australia, and Ontario, Canada came from this movement. In overseas these communities maintained strong ties to the homeland, continued to speak German over generations, and developed extensive education and mission programs such as that offered at the seminary in Neuendettelsau, in Franconia. In the establishment of a German central government after 1871, a consequence of the German unification, new tensions of what it meant to be a German merged with notions of religious differences, creating a so-called Kulturkampf, or War of Culture against the Catholic church in the 1870s. The Kulturkampf aimed to restrain and hamper the factual or rather imagined influence of the Catholic church. There was little solidarity of Protestants and Protestant churches with the Catholic church under political attack. To prevent criticism of state policies, whether national or regional, an 1871 Pulpit Law prohibited pastors and priests from discussing state policy in their homilies, mostly hitting Catholic priests whose church and institutions were the government target. In particular, this law targeted a nascent German Old Catholic Church movement, one free of ultra-montanism, or control by the Vatican. A widely spread belief in a Jesuit conspiracy to taint the new "Germany" gathered momentum, particularly focused against the regions in which Catholicism had a long-standing foothold, such as Bavaria, Baden, the middle Rhineland, in the vicinity of the former Electorate of Cologne in then Prussia. The movement further targeted Jews, (especially those newly-arriving from Russian Poland), and a few hundreds of Mormons and Jehovah's Witnesses — like other new Protestant denominations — then still suspect to sectarianism. At the same time, political organizations, such as the Catholic Centre Party, acquired political clout by supporting religious liberty, defending access of Catholics and other groups to primary, secondary and university education, employment, and professions, promoting the idea that legal equality was the basis of government. Under the Weimar Republic, the system of state churches disappeared with the German monarchies. At this point, the unification of the Protestant churches into a single organization seemed like a possibility, albeit a remote one. Since unification, clergy and ecclesiastical administrators had discussed a merger, but one had never materialised due to strong regional self-confidence and traditions as well as the denominational fragmentation of Lutheran, Calvinist and United churches. In 1920, Swiss Protestant churches came together in the Schweizerischer Evangelischer Kirchenbund (SEK). Following their example, the then 28 territorially defined German Protestant churches founded the Deutscher Evangelischer Kirchenbund (DEK) in 1922. This was not a merger into a single church but a loose federation of independent ones. The founding of the German Evangelical Church was the result of work by the German Christians who had gained a large majority at the 1933 church elections. In September 1934, the merger finally failed when the synods of two of the 28 churches, the Evangelical Lutheran Church in Bavaria right of the river Rhine, the portion of Bavaria which forms today's Free State (without the Palatinate left of the Rhine), and the Evangelical State Church in Württemberg, refused to dissolve their church bodies as independent entities, and the Berlin-based Landgericht I court restored the largest church body, the by then already merged Evangelical Church of the Old-Prussian Union by its resolution in November the same year, thus resuming independence. Consequently, the German Evangelical Church, created as a merger, then continued to exist as a mere umbrella. Ludwig Müller was elected "Reich Bishop". Some Protestant functionaries and laymen opposed the unification. Many more agreed but wanted it under Protestant principles, not imposed by Nazi partisans. The Protestant opposition had organised first among pastors by way of the Emergency Covenant of Pastors and then—including laymen—developed into grassroots meetings establishing independent synods by January 1934. At the first Reich's Synod of Confession (erste Reichsbekenntnissynode) held in Wuppertal-Barmen between 29–31 May 1934, it called itself the Confessing Church. On 16 July 1935, Hanns Kerrl was appointed Reichsminister for Church Affairs, a newly created department. He started negotiations to find a compromise and dropped the extreme German Christians, trying to win moderate Confessing Christians and respected neutrals. On 24 September 1935, a new law empowered Kerrl to legislate by way of ordinances within the German Evangelical Church, circumventing any synodal autonomy. Kerrl managed to gain the very respected Wilhelm Zoellner (a Lutheran, until 1931 General Superintendent of the old-Prussian ecclesiastical province of Westphalia) to form the Reich's Ecclesiastical Committee (Reichskirchenausschuss, RKA) on 3 October 1935, combining the neutral and moderate groups to reconcile the disputing church parties. The official German Evangelical Church became subordinate to the new bureaucracy, and Müller lost power but still retained the now meaningless titles of German Reich's Bishop and old-Prussian State Bishop. In November, Kerrl decreed the parallel institutions of the Confessing Church were to be dissolved, a move which was protested and ignored by Confessing Church leaders. On 19 December Kerrl issued a decree which forbade all kinds of Confessing Church activities, namely appointments of pastors, education, examinations, ordinations, ecclesiastical visitations, announcements and declarations from the pulpit, separate financial structures and convening Synods of Confession; further the decree established provincial ecclesiastical committees. Thus, the brethren councils had to go into hiding, and Kerrl successfully wedged the Confessing Church. The Gestapo increased its suppression, undermining the readiness for compromises among the Confessing Church. Zoellner concluded that this made his reconciliatory work impossible and criticised the Gestapo activities. He resigned on 2 February 1937, paralysing the Ecclesiastical Committee which lost all recognition among the opposition. Kerrl now subjected Müller's chancery of the German Evangelical Church directly to his ministry and the national, provincial and state ecclesiastical committees were soon after dissolved. Although the church was initially supported by the regime, the Nazis eventually lost interest in the experiment after it failed to supplant or absorb traditional Protestant churches. After 1937, relations between the Reich Church and the Nazi government began to sour. On 19 November 1938, as reported on in the Ludington Daily News, YHWH was ordered erased from Protestant churches within the Evangelical Church of the old-Prussian Union by Friedrich Werner, the president of its executive board (Evangelical Supreme Church Council; EOK). His order said the name of the 'God of Israel' (which contemporarily has Judaic connotations) must be obliterated wherever it was displayed in Protestant churches. On 1 September 1939, Kerrl decreed the separation of the ecclesiastical and the administrative governance within the official Evangelical Church. The German Christian Friedrich Werner, president of EOK, won over August Marahrens, State Bishop of the "intact" Evangelical Lutheran State Church of Hanover, and the theologians Walther Schultz, a German Christian, and Friedrich Hymmen, vice president of the Old-Prussian Evangelical Supreme Church Council, to form an Ecclesiastical Council of Confidence (Geistlicher Vertrauensrat). This council exercised ecclesiastical leadership for the church from early 1940 and afterward. On 22 December 1941, the German Evangelical Church called for suited actions by all Protestant churches to withhold baptised non-Aryans from all spheres of Protestant church life. Many German Christian-dominated congregations followed suit. The Confessing Church's executive together with the conference of the state brethren councils (representing the Confessing Church adherents within the destroyed churches) issued a declaration of protest. After World War II, Theophil Wurm, Landesbischof of Württemberg, invited representatives of the surviving German regional Protestant church bodies to Treysa (a part of today's Schwalmstadt) for August 31, 1945. As to co-operation between the Protestant churches in Germany, strong resentments prevailed, especially among the Lutheran church bodies of Bavaria right of the river Rhine, the Hamburgian State, Hanover, Mecklenburg, Saxony, and Thuringia, against any unification after the experiences during Nazi rule. It was decided to replace the former German Federation of Protestant Churches with the new umbrella Evangelical Church in Germany, provisionally led by the Council of the Evangelical Church in Germany, a naming borrowed from the Reich's brethren council organisation. ↑ "Germany". Berkley Center for Religion, Peace, and World Affairs. Retrieved 2014-07-27. "Unification, World Wars, and Nazism"
↑ The 1933 German Protestant Church Elections: Machtpolitik or Accommodation? by Shelley Baranowski. Church History, Vol. 49, No. 3 (Sep., 1980), pp. 298–315. Cambridge University Press on behalf of the American Society of Church History. ↑ The law was called Act on Safeguarding the German Evangelical Church (German: Gesetz zur Sicherung der Deutschen Evangelischen Kirche, or colloquially Sicherungsesetz. Cf. Krüger and Noss, pp. 149–171, here p. 161. ↑ Krüger and Noss, pp. 149–171, here p. 161. ↑ Krüger and Noss, pp. 149–171, here p. 163. ↑ Krüger and Noss, pp. 149–171, here p. 164. ↑ Circular (Rundschreiben) by the church chancery of the German Evangelical Church to all governing bodies of the major Protestant Landeskirchen (22 December 1941), published in Kurt Meier, Kirche und Judentum: Die Haltung der evangelischen Kirche zur Judenpolitik des Dritten Reiches, Halle upon Saale: Niemeyer, 1968, pp. 116seq. No ISBN. ↑ Published in Kirchliches Jahrbuch für die Evangelische Kirche in Deutschland; vol. 60-71 (1933-1944), Joachim Beckmann (ed.) on behalf of the Evangelische Kirche in Deutschland, Gütersloh: Bertelsmann, 1948, pp. 482-485. ISSN 0075-6210. Baranski, Shelley. "The 1933 German Protestant Church Elections: Machtpolitik or Accommodation?". Church History, Vol. 49, No. 3 (Sep., 1980), pp. 298–315. (German) Beckman, Joachim, (ed.). Published in Kirchliches Jahrbuch für die Evangelische Kirche in Deutschland; vol. 60-71 (1933-1944), Joachim Beckmann (ed.) on behalf of the Evangelische Kirche in Deutschland, Gütersloh: Bertelsmann, 1948, pp. 482–485. ISSN 0075-6210. (German) Krüger, Barbara & Noss, Peter (1999) "Die Strukturen in der Evangelischen Kirche 1933-1945", in: Kühl-Freudenstein, Olaf, et al. (eds. )Kirchenkampf in Berlin 1932-1945: 42 Stadtgeschichten (Studien zu Kirche und Judentum; vol. 18) Berlin: Institut Kirche und Judentum ISBN 3-923095-61-9 pp. 149–171. (German) Schneider, Thomas M. (1993) '"Reichsbischof Ludwig Müller: eine Untersuchung zu Leben und Persönlichkeit." Arbeiten zur kirchlichen Zeitgeschichte, Series B: Darstellungen; 19. (384 pp) Göttingen: Vandenhoeck & Ruprecht. Review of "The Holy Reich"